Without the right mobility strategy, your company data might be outside your control. Microsoft has the tools you need to initiate an enterprise mobility strategy that gives you control of your sensitive corporate data—virtually anywhere and anytime. Your workforce is on the move and now you can safeguard your data across devices inside and outside your organization, as well as devices that hold a combination of personal and corporate data. Tap the security value Windows 10 extends through Microsoft Enterprise Mobility Suite, and keep control of your data no matter where it ends up. 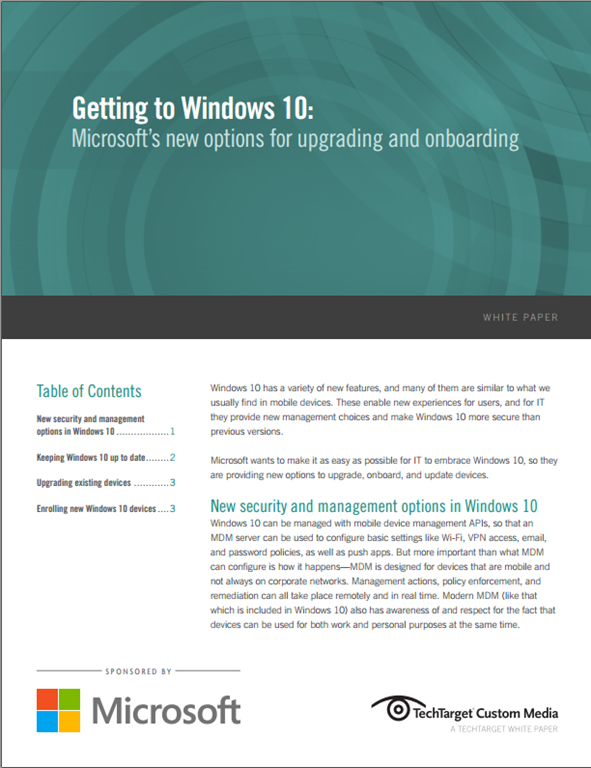 Sign up now for the first in a series of three whitepapers by Jack Madden, “Getting to Windows 10: Microsoft’s new options for upgrading and onboarding." Microsoft Enterprise Mobility Suite + Windows 10 = Better Together. Keep your users productive and better protect your corporate data.